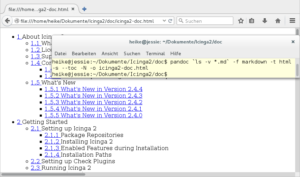 Pandoc is part of most Linux distributions and you can install it with the package manager. If the version in the repositories is too old or if you’re running OS X or Windows, have a look at the Pandoc website and follow the download links. As you can see, you now have a local copy, including the doc directory where you can find various .md files. Subdirectories with images are also included. You’re now ready to use the pandoc command to convert the files and create the document of your choice. Since converting from Markdown (-f markdown) to HTML (-t html) is the default behaviour, the two options are not really necessary in this case. Supported input and output formats are listed in the manpage. If either of those formats is not defined explicitly, Pandoc will try to guess from the file extension. It’s possible to include CSS stylesheets to create a custom look for your HTML handbook. Either use -H file.css to include the content of the file at the end of the header, or link to a stylesheet by defining the URL (-c URL). 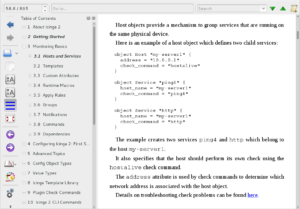 Again, the -s option tells Pandoc to produce a header, in this case a preamble for the LaTeX file. It defines the document type, the paper and font size, additional packages, etc. Pandoc produces typographically correct output and adjusts quotation marks, dashes, non-breaking spaces and so on. In the next step you can create a PDF document. Make sure to install LaTeX first, e.g. 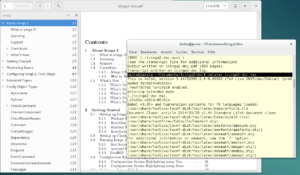 the texlive packages (Linux), MacTeX (OS X), or MiKTeX (Windows). 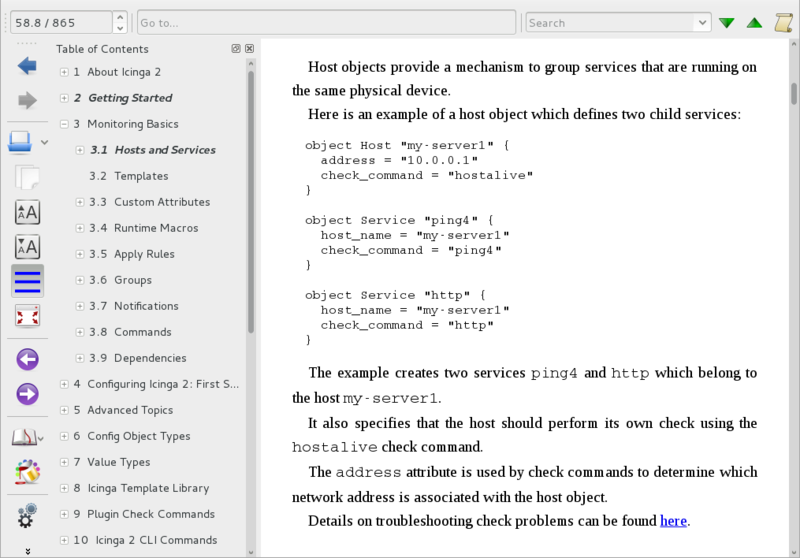 Note: To compile the Icinga documentation, choose the xelatex typesetting engine instead of latex or pdlatex. It supports Unicode and is part of the standard LaTeX installation. Also keep in mind that the document needs to be compiled twice if you’re including a table of contents. The option –toc is missing, since it has no effect in this case – Pandoc won’t create a table of contents for this output format. It does apply the predefined heading paragraph styles, though, so it is no problem to create the table of contents in LibreOffice or Apache OpenOffice. Another cool feature is that you can define OTT files as templates for the new book. Download an existing template or create your own, and then use –reference-odt=template.ott to assign it. 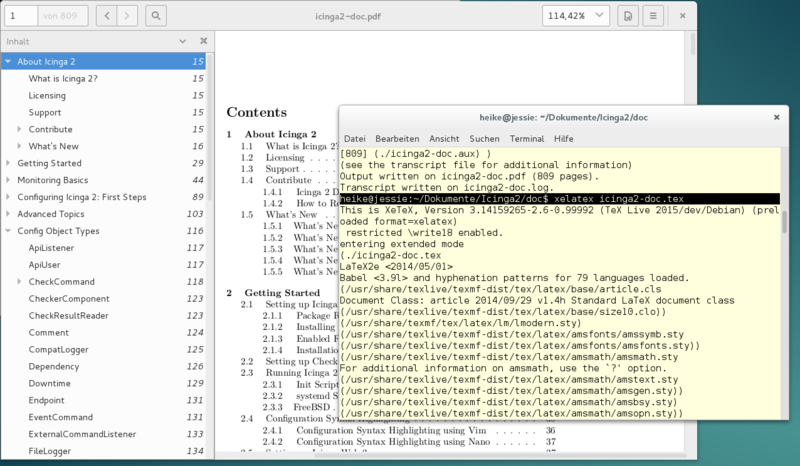 Pandoc ignores the contents and uses merely the stylesheets for the output. That’s it – you can now upload the EPUB file to your reader. Alternatively, you can open it in Calibre, a program that manages your your e-book collection, offers an internal reader, changes the metadata of books and converts them into other e-book formats. Pandoc itself is able to apply an external CSS stylesheet during the conversion. So, if you’re not happy with the default look, create your own or do a web search for other EPUB CSS files. To specify the stylesheet, use –epub-stylesheet=file.css. You can even add a cover image (–epub-cover-image=image.png) or take an influence on the metadata (–epub-metadata=file).